What happened to Brazil, Russia, India and China as the BRICs? WASHINGTON — The 2020 Democratic presidential primary hung a left turn out of the gate, leaving the middle of the field wide open for … someone. “We really, really don’t know yet,” said Matt Bennett, a vice president of the centrist Democratic think tank Third Way. He’s not panicking this early in the election cycle. “This year will be about playing to the activists on Twitter and online donor universe. Next year will be about winning votes, and those are very different universes,” Bennett said. In 2016, it was progressives who were left waiting, begging even, for a champion to enter the ring against the front-runner, Hillary Clinton. First, they tried to draft Sen. Elizabeth Warren of Massachusetts, then they rallied around Sen. Bernie Sanders of Vermont as the non-Clinton alternative. This year, though, progressives have an embarrassment of riches, with Warren and perhaps Sanders back to set the pace and fresher faces like Sen. Kamala Harris of California, among others, embracing single-payer health care and other left causes with a convert’s zeal. Now it’s moderate Democrats who are left waiting and worrying about finding a nominee who they think can beat President Donald Trump. One potential contender for those unsatisfied with their current options is Sen. Amy Klobuchar of Minnesota, who announced her candidacy on Sunday. Michael Bloomberg, the billionaire former mayor of New York, has slammed the liberal candidates’ soak-the-rich tax plans as he weighs a bid. And ex-Virginia Gov. Terry McAuliffe, who knocked the “dishonest populism” of the left in a recent op-ed, may enter the contest in March. But everyone is living the shadow of former Vice President Joe Biden, who comfortably leads polls of the nascent Democratic field. “That (moderate) lane would be secured if the vice president makes the decision to get in,” said Harold Schaitberger, the longtime president of the International Association of Fire Fighters and vice president of the AFL-CIO. Members of the firefighters’ union voted narrowly for Barack Obama in 2008 and 2012, but broke heavily for Trump in 2016, according to an internal poll conducted by the union and shared with NBC News. If Biden doesn’t run, the 316,000-strong union will look for someone who can appeal to “pragmatic” and “middle of the road” voters, many of whom had once been reliable supporters of Democrats, Schaitberger said. That’s a sentiment shared by many of the party’s donors and other gatekeepers, who will look for someone to fill the void left by Biden if he passes on running again, as he did in 2016. Their numbers are waning, but about 35 percent of Democrats still call themselves moderates while another 13 percent identify as conservative, according to a recent Gallup survey. At the moment, however, seven of the eight major declared candidates support Medicare for All, which has prompted some uncomfortable questions on whether they are really prepared to eliminate all private health insurance. The pileup on the left led Trump to raise the specter of socialism in his State of the Union Address last week and make comparisons to Venezuela, while ex-Starbucks CEO Howard Schultz says there is no longer room for him in his former party, leading him to consider an independent presidential run. “Are any 2020 Presidential candidates paying attention to this?” asked former Sen. Claire McCaskill, a Democrat who lost re-election in Missouri last year, on Twitter. But many mainstream Democrats think Schultz’ claim that the left has taken over the party is ludicrous. They point out that in the midterm elections in November, progressive insurgents fared poorly in swing districts in both primaries and the general election. “We’re going to look for that candidate that we think can best beat Trump — period,” said Robert Wolf, the former chairman of UBS and a major Democratic donor who served as an economic adviser to President Barack Obama. “For me, it’s going to take someone who supports progressive issues like gun reform and climate change, but must be a pro-growth Democrat to win on the economy,” Wolf added. Of course, electability is a fuzzy concept after the surprise result of the 2016 election, and progressives and people of color have been challenging the conventional wisdom that appealing to the center is party’s best strategy. It’s also unclear if moderate Democrats could coalesce around one candidate in the primary since they include a wide range of groups with cross-cutting values: religious African-Americans and Latinos with more conservative views on abortion; cosmopolitan professionals who want to fight climate change and the gun lobby but keep taxes low; and noncollege educated whites who might be OK with guns rights and soaking the rich. So some candidates will likely be able to appeal to moderates for personal or demographic reasons, even while running on a progressive platform. For instance, one name being floated by centrist Democrats is Sen. Sherrod Brown of Ohio, one of the Senate’s most liberal members who nonetheless consistently wins re-election in an increasingly red state, which also happens to be a key presidential battleground. Brown, who is currently testing the waters by touring early primary and caucus states, has made a point of refusing to join the bandwagon in support of Medicare for All and the Green New Deal, the environmental plan popularized by Rep. Alexandria Ocasio-Cortez, D-N.Y. Ultimately, though, the party’s nominee will likely have to transcend labels. That’s led some moderates to express interest in a candidate like Beto O’Rourke, the former congressman who defies simple ideological categorization and ran a Senate race in Texas last year on a hopeful message that allowed people to project their own values onto him. WASHINGTON — Congress wanted to honor the ailing Sen. John McCain, R-Ariz. President Donald Trump did not. In extended remarks during a visit to Fort Drum in upstate New York to sign the John S. McCain National Defense Authorization Act for Fiscal Year 2019 — this year’s version of an annual bill that sets defense policy — Trump chose not to mention the former prisoner of war and Senate Armed Services Committee chairman who is battling brain cancer. He even omitted McCain’s name when citing the title of the bill. The snub at Fort Drum, home to the combat aviation brigade of the Army’s 10th Mountain Division, did not escape the notice of McCain’s allies. “For those asking did I expect Trump to be an a—— today. No more than I expected it to be Monday,” Mark Salter, McCain’s longtime aide, wrote on Twitter. McCain’s condition — dire enough that a recent HBO documentary on him was titled “John McCain: For Whom the Bell Tolls” — has not stopped Trump from deriding the Arizona senator at political rallies. Though Trump does not use his name, he tells crowds that he would have been able to repeal Obamacare if not for a thumbs-down sign from one senator — McCain. The senator’s own statement included Trump’s name in the headline and in a preamble written by staff. But the words attributed to McCain did not. “I’m very proud that the National Defense Authorization Act for Fiscal Year 2019 has been signed into law,” he said. President Donald Trump said Saturday that a third summit with North Korea’s Kim Jong Un “would be good” as the two leaders expressed openness to reviving their stalled nuclear diplomacy. Trump’s early weekend message on Twitter came after Kim said he would consider another summit, but set the year’s end as a deadline for Washington to offer mutually acceptable terms for an agreement, the country’s state-run media said. Kim made the comments during a speech Friday at a session of the North Korea’s rubber-stamp parliament, which made a slew of personnel changes that bolstered his diplomatic lineup amid stalemated negotiations with the United States. According to the Korean Central News Agency, he blamed the collapse of his summit with Trump in February on what he described asunilateral demands by the U.S., which he said raised questions over whether Washington has genuine willingness to improve relations. “I agree with Kim Jong Un of North Korea that our personal relationship remains very good, perhaps the term excellent would be even more accurate, and that a third Summit would be good in that we fully understand where we each stand,” Trump responded. Kim’s speech came hours after Trump and visiting South Korean President Moon Jae-in met in Washington and agreed on the importance of nuclear talks with North Korea. The United States has said the summit in Vietnam broke down because of the North’s excessive demands for sanctions relief in return for limited disarmament measures. In their first summit last June in Singapore, Trump and Kim issued a vague statement calling for a nuclear-free Korean Peninsula without describing when and how it would occur. “If the United States approaches us with the right manner and offers to hold a third North Korea-U.S. leaders’ summit on the condition of finding solutions we could mutually accept, then we do have a willingness to give it one more try,” he added. The lack of substantial disarmament commitments from the North and the deepening impasse in nuclear negotiations have fueled doubts on whether Kim would ever voluntarily relinquish an arsenal he may see as his strongest guarantee of survival. Max Burman is a news and homepage editor for NBC News. 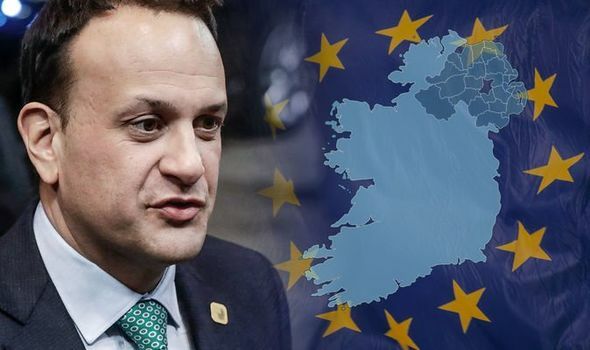 BRITAIN’s failure to deliver Brexit on time will cause chaos at the upcoming European Parliament elections and may force Ireland to count its votes twice, Irish Prime Minister Leo Varadkar has warned.